Can you imagine a world without SnapChat, Google Maps and selfies? It may not sound like a world worth living in, but if we don't start thinking about how to protect Earth from the Sun, a techapocalypse could be on the cards sometime this century. So says a study by Avi Loeb and Manasvi Lingam from the Harvard-Smithsonian Center for Astrophysics, published in the The Astrophysical Journal. It indicates that we're badly underestimating how potentially deadly the Sun is. Their solution? Build a 105-ton shield in space. But how? And do we really need to? That would be a solar super-storm. The Sun may be a life-giver, but its unpredictable power could one day cause a catastrophe. A massive solar flare has the power to knock out satellites, communications systems and damage the digital technologies we now all use daily, including smartphones, TVs and radios. Given how reliant we are on satellite technology – for navigation, communications and for entertainment – that's probably the big one. A solar super-storm could blank sat-nav systems by interrupting the radio transmission paths between the satellites and devices on the ground. Aircraft and shipping, in particular, could suffer. Some satellites will be destroyed, and the entire fleet will be severely aged by such an event, making new launches necessary (SpaceX and the rest of the space industry would be quids-in). Perhaps the key finding of the paper is that the economic losses caused by a flare 150 years in the future would equal that of the current GDP of the USA. So this is about insurance against an economic catastrophe. 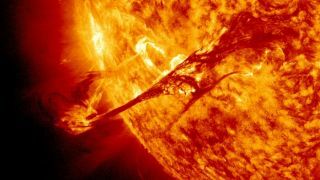 A severe solar storm could cause a sudden massive surge of current that brings down power grids. The worst case scenario would see geomagnetic forces damage super grid transformers for weeks and months. Developed countries tend to have significant redundancy in the network, but that doesn't apply to most of the world. Another issue would be increased radiation, with those travelling in aircraft during a solar super-storm exposed to a one-off dose of radiation. Theorising that the next big solar flare is coming within 100 years, the Harvard researchers compared geological records with data about the activity of stars similar in size to our Sun. They calculated that ultra-risky 'extinction-level' super-flares – though "not sufficiently appreciated" – only happen every 20 million years, but that techapocalypse-grade flares are far more likely. Exhibit number one is the so-called Carrington Event, the most famous case of harmful space weather ever recorded. It occurred in September 1859 when a mega-flare recorded on the Sun triggered the biggest solar storm of the last 500 years. It knocked-out telegraph lines and started fires in telegraph stations in Europe and North America. Another major incident in 1989 caused a blackout in Canada that left six million people without electricity for nine hours, while in 2010 a solar superstorm much like that which caused Carrington missed Earth only by about nine days. Some estimated that the economic cost would have been about US$2.6 trillion over at least four years. Considering how much we now depend on technology and communications, the risks of being hit by extreme space weather are far greater than ever. Are we ready? That would be Earth's own natural magnetosphere. A coronal mass ejection (CME) – an explosive blast of plasma from the Sun’s surface seen from Earth as a black spot on the Sun – can cause a geomagnetic storm to drift towards Earth. It happens all the time, but most miss Earth completely. Earth's atmosphere does provide some protection against solar activity, essentially funnelling highly charged solar wind towards the polar regions, areas that frequently suffer interruptions to radio. One visible consequence of space weather is the spectacular aurora borealis and aurora australis, the Northern and Southern Lights, which display in an oval shape around the planet's poles. They're caused by super-charged electrons hitting Earth's upper atmosphere about 60 miles up and colliding with other molecules, emitting light. However, there is some good news; space-weather takes a few days to reach Earth, so even if billions of tons of solar particles are spewed out by the Sun and head our way, we will get some warning. In fact, upon hearing about heightened space weather, dedicated aurora-hunters often head for the Arctic Circle to view the resulting aurora. A Sun-shield would cost about the same as the International Space Station. Credit: Avi Loeb and Manasvi Lingam/The Astrophysical Journal. Our own atmosphere might be good, but it's not great. So let's make it great, write Lingam and Loeb, who propose a huge 105-ton magnetic shield surrounding Earth to protect the planet by setting up a magnetic shield to deflect charged particles and save our smartphones. They reckon it would cost about US$100 billion – about the same as the International Space Station – and "three to four orders of magnitude lower than the current world GDP, or the economic damage from a flare around 100 years henceforth." Why not? Aliens would do it, after all. "It seems reasonable to conclude that technologically advanced civilisations on planets orbiting these stars would be well aware of the economic and biological risks posed by flares and super-flares," reads the paper. "In order to mitigate the damage wrought by extreme space weather events, it is very conceivable that they would adopt shielding strategies against such phenomena.… [This would] necessitate large-scale engineering projects that may be detectable by future observations." Lingam and Loeb propose putting a shield at the Lagrange point L1, which lies between Earth and the Sun about a million miles from Earth. The researchers also pointed out that the Kepler Space telescope has proved that super-flares are more common on M- and K-dwarf stars – the most common stars in the galaxy – so any advanced civilisations out there have probably already constructed magnetic shields. So why not use the James Webb Space Telescope (JWST) to look for the 'techno-signatures'? Lingam and Loeb think that the harm caused by a super-solar flare will be particularly damaging in the decades to come, not because the Sun is going to be particularly active, but because of where our civilisation is at. “The vulnerable phase is during the relatively short-lived regime of exponential amplification that is likely to begin a few decades henceforth," they write. A major solar super-storm may be a once-in-100 years event, but it's a chilling reminder that even at 150 million kilometres distant, the Earth still lies within the Sun's atmosphere.